Transform an ordinary mattress into luxury bedding with a Magic Loft Mattress Pad from Laurens Linens. Magic Loft is a Down alternative mattress pad that provides all the luxury of a down filled pad, is hypo-allergenic and much less expensive than a down filled pad. 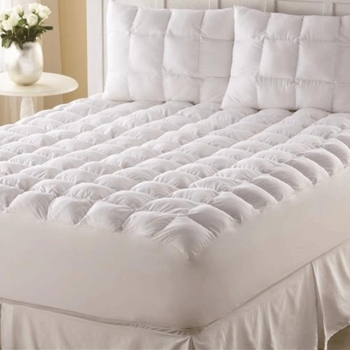 Magic Loft cover is constructed of 200 thread count 100% cotton and each pad is treated pad with Stain Release and Repel. Magic Loft pads are individually hand filled with Magic Loft® hypoallergenic fiber fill for additional support and comfort. Custom Tailorfit® Skirt is guaranteed to fit any mattress up to 18"
Every Magic Loft mattress pad is backed by a 3 Year Manufacturers Warranty.